Welcome to our 6 day winter escape, where we will be Discovering Brisbane’s Historic Past. With our bags packed we make our way to Sydney Airport for our mid-morning flight with Virgin Australia that will have us arriving just before Mid-day. A local coach will greet us and our first stop is for lunch at the (Norths Devils Club in Nundah). We commence our sightseeing at one of the best vantage points in town – The Wheel of Brisbane. This giant observation wheel offers a spectacular 360 degree panoramic view of Brisbane City from the heart of Brisbane’s cultural, lifestyle and entertainment precinct, The Parklands, South Bank. We have some time to take a look around the South Bank area before checking into the Hotel Grand Chancellor Brisbane that overlooks the Roma Street Parklands. Following breakfast we join our local coach operator for a sightseeing tour around Brisbane. 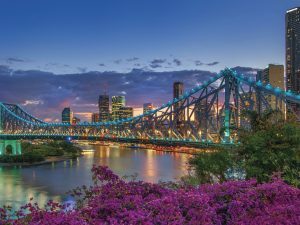 With a sub- tropical climate, gardens and parks and an ever changing contemporary skyline, Brisbane is a great place to escape the Sydney winter. Next we are going behind bars at the Old Boggo Road Gaol. Named after the road which led to it, that became a boggy quagmire after rain, “Boggo Road Gaol” was officially known as the Brisbane Prison. For 109 years it dominated the skyline of the capital of Queensland. It’s stark red brick walls, and imposing guard tower on Annerley Road have become iconic for all the wrong reasons. 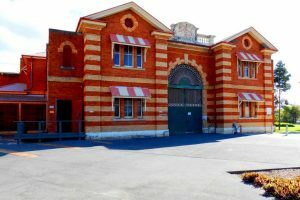 Since 2001, The Prison Players have been recreating “life” inside its red-brick walls, to thrill and chill audiences – entertaining and educating visitors. Our historical tour will see us immersed in the past – passing through authentic daily re-enactments – from sensational gaol breaks, riots and protests to the mundane, daily procedures, chores, and duties of inmates and officers. On conclusion of the tour we take a drive to the highest hill in the city – Mt Cootha Lookout where we enjoy the scenery over lunch. Just down the hill are the Brisbane Botanic Gardens and here we are taken on a guided walking tour and some free time to explore the gardens. This afternoon we return to our hotel and have some time to relax or explore Brisbane. Today we will be heading to the area about an hour south of Brisbane that is also known as the Scenic Rim. It is here that we enjoy a true farming experience at Towri Sheep Cheeses. Our morning will consist of a milking demonstration, cheese tasting, and we will have access to the cheese room to learn about the basics of cheese making. By the time we have finished we will know the differences between sheep, cow and goat cheese! The Scenic Rim is also home to many fruit and vegetable crops and as we tour through the region we will see fields full of colorful produce such as carrots, onions, beans, corn, beetroot, potatoes and more. For lunch we stop in the quaint township of Boonah at the Dugandan Hotel and then we will be calling into one of the region’s most interesting places – Summer Land Camel Farm. Here we will learn about the history of camels in Australia and the powerful immune proteins that are contained in camel milk. Our tour takes in the interesting farming operations and we get to meet the camels and have afternoon tea before returning to Brisbane. – The Breakfast Creek Hotel. Staying in the area we call into Miegunyahn House Museum for a tour. Owned by the Queensland Women’s Historical Association, Miegunyah was built in 1886 for Herbert and Leila Perry. It is richly decorated with iron-lace balustrades, filigree columns and friezes, and furnished in the style of the late 19th century. Following our tour we return to our hotel for some free time before dinner. We have a fantastic day of touring planned today, as we will be heading across to North Stradbroke Island, or “Straddie” as the locals call it. 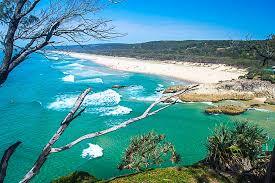 Making our way to Cleveland, we board the ferry across to Stradbroke Island and arrive in Dunwich to start our touring. Our first visit is to the North Stradbroke Island Historical Museum that has an extensive history covering the Quandamooka people, convict history, shipwrecks and maritime history on the Island. We will also have a local guide welcome us and show us many of the local traditions and stories relating to the Quandamooka people. Next we take a sightseeing drive around the Island and arrive at Point Lookout where we can take the Gorge Walk which follows the coastline and is the best vantage point to look out to sea. With a little luck we may spot some local wildlife, such as Turtles, Dolphins and Manta Rays, or even a Humpback Whale if we are lucky. Lunch today is at the Stradbroke Island Beach Hotel and here we can enjoy a delicious meal with the stunning views lookout out towards the ocean. We take the ferry back to the mainland and re-trace our steps into Brisbane for our final dinner for the tour. Sadly our tour has come to an end and we can enjoy our final breakfast together before we complete our checkout formalities and transfer to the Brisbane airport for our flight back to Sydney. We farewell our fellow travelers and return home after another fantastic time away with Aussie Sights Tours and Travel.